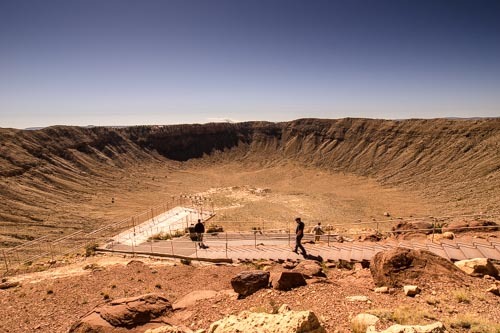 Every time I drove by Meteor Crater, just east of Flagstaff, I couldn’t help but wonder if it was accessible. After all, it is a crater. Well, yesterday I tuned the radio to 1610 like the billboards instructed, and I was thrilled to hear that they “have a new quarter-mile wheelchair-accessible trail along the rim of the crater.” That sold me, so we turned off the interstate to explore this unique natural wonder. At first glance it appeared that I made a good choice, as there is plenty ofaccessible parking near the ticket window, with ramp access up to the entrance. They even put in a standard door, for people who couldn’t access the revolving door, And there is elevator access to the upper level, where the museum, theater and the trail around the crater are located. I was very encouraged, so I paid the hefty $16 entrance fee. Upstairs, there is level access to the museum, but I was really disappointed with the content. It hasn’t been updated in several years, and it didn’t even mention the Chelyabinsk meteor, which fell to earth in Russia last year. Then I headed into the theater, which has companion seats near the wheelchair-accessible spaces in back. I was equally disappointed in the promo clip that they showed, which highlighted the work of the B612 Foundation, that tracks meteors in close proximity to Earth. Again, it might have been interesting if it had some depth to it, but it was clearly a promo fluff piece. Nonetheless, I was there to see the crater, so after the film I headed to the door to the wheelchair-accessible walkway. Unfortunately there was a sign on the locked door saying that it could only be accessed on the guided tour. Since the tour is included in admission, I asked the guide if the tour was wheelchair-accessible. He replied that the quarter-mile trail around the rim was wheelchair-accessible, and there were just three steps down to it. Then he got an attitude. Seriously? Just three steps? In other words, it’s not wheelchair-accessible. The guide also added that once folks went out that door on his tour there was no turning back, so they had to be able to deal with the 5,000 foot elevation, and the half-mile walk. He did tell me that the other side of the crater had a wheelchair-accessible trail, and directed me to it. I was hugely disappointed when I got there, as there was just a short patch of asphalt outside of the building that someone in a wheelchair could access. Able-bodied visitors had the option of visiting several other viewpoints, all of which had stairs and steep inclines. The bottom line is, if you can’t walk, it’s best to bypass Meteor Crater, and save your $16. I think it’s a shame that they advertise a “wheelchair-accessible” trail that has three steps down to it. After their recent renovations, it seems they could have at least made that trail accessible to everyone. Sadly, that’s not the case. So , save your $16, and keep on tooling down the highway. You’ll be glad you didn’t stop at this inaccessible roadside rip-off! This entry was posted in Attractions and tagged Arizona, attraction, crater, disabled, Flagstaff, I-40, meteor, road trip, roadside, slow walker, travel, wheelchair by Candy B. Harrington. Bookmark the permalink.